To help raise awareness about skin cancer and the importance of sun protection, UV Skinz will be including a free UPF 50+ Baby Sun Shirt with every order placed during the month of May. I’d like to tell you a story. A story with a great deal of pain, but also much triumph. On September 14, 2001 I lost my husband Darren, to melanoma at the age of 32. For those of you who aren’t familiar with the disease, melanoma is the deadliest form of skin cancer. With more than 85 percent of melanoma being attributed to exposure to UV radiation, a lack of proper sun protection is often to blame when the disease develops. Darren was no exception to this statistic, being an avid outdoorsman with a long history of sunburns growing up. After a difficult five-year battle with the disease, melanoma took Darren from me and from our three young boys. Our lives were changed forever. The unexpected loss of my husband and the reality that I was now a single mother to our three beautiful boys, aged 1, 3 and 6, left me completely devastated. Despite the heartbreak and anxiety I experienced, his loss gave me an undeniable drive – a gift really ­– to prevent other families from experiencing the same fate. I decided to work through the grieving process by submerging myself into several years of research and development, and in the spring of 2006 the first UV Skinz UPF 50+ sun shirt was born! This year we celebrate 10 years of providing families peace-of-mind in the sun. Providing sun protective products is only one aspect of my passion to prevent families from experiencing skin cancer; I am equally passionate about sun safety education. Awareness and prevention practices must begin with the youngest members of the family. Many people are unaware that a single severe sunburn during the first 15 years of life doubles a child’s risk for developing melanoma later on. As parents we need to do everything in our power to ensure our children never feel the pain of a sunburn and keep their risk for developing melanoma later in life as low as we can. I know as a fellow mother you too want to protect your children and instill sun-safe habits that will last a lifetime. Join me in our mission to GET KIDS COVERED, and SAVE A BABY’S SKIN this May. 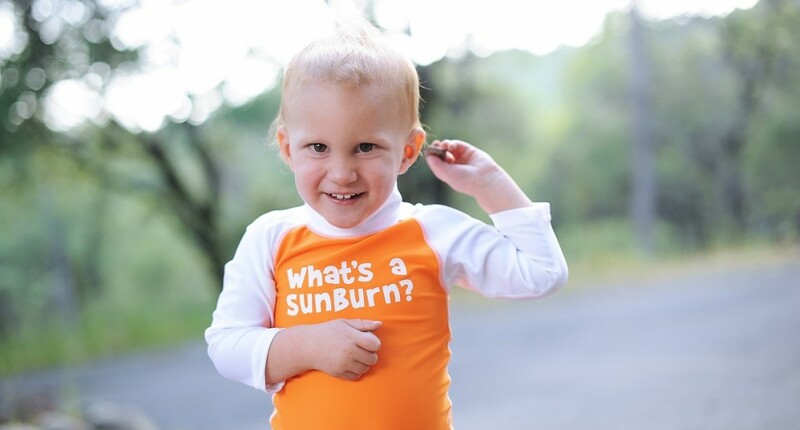 During the entire month of May in honor of Skin Cancer Awareness month and in connection with the company’s “Save a Baby’s Skin Campaign,” UV Skinz will include a FREE My First Skinz “What’s a Sunburn?” UPF 50+ Baby Sun Shirt (size 12/24 months) with EVERY order placed. To receive your FREE Baby Sun Shirt, simply visit us at uvskinz.com and a limited edition Baby Sun Shirt will be automatically included in your order with any purchase. In addition to the free baby sun shirt, UV Skinz is offering you an exclusive discount of 20% off with coupon code 20DEAREST.